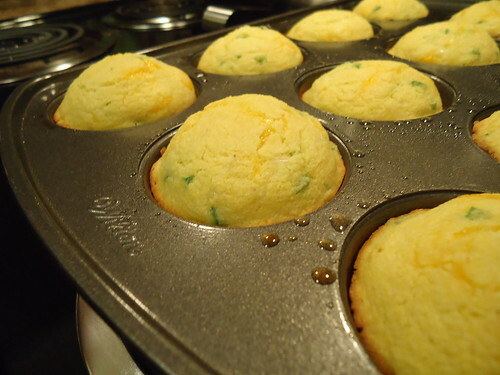 the perfect compliment to gumbo is this cornbread. this is another dish where tom and i had to negotiate. i love sweet cornbread; tom calls sweet cornbread “cupcakes” and asks for a side of frosting. i cut back on the sugar in the recipe and added cheese… two kinds! definitely a win-win for the shoemaker household. in a bowl, combine the first seven ingredients. in another bowl, whisk the eggs, buttermilk and oil. add to the dry ingredients and stir until just moistened. fold in the cheese. pour into a greased 9″ square baking dish or a muffin pan, divided in 12 parts. bake at 400° for 15 min (muffins), or 20 min (square pan) or until a toothpick inserted near the center comes out clean.